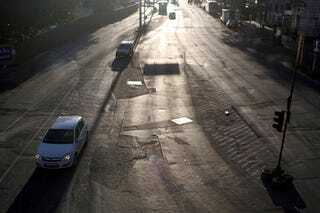 If you live in a big city, you walk by scarred and patched asphalt every day. But it takes a keen eye for lighting to photograph the almost sentient surface of a city road. The scene was photographed at dawn somewhere in Budapest by the sublime Nak, whose work also includes a heavy smattering of interesting automobiles, like this BMW 3.0 CS or this Tatra 603.